A myriad of scoring instruments exist for use in clinical research. Choosing the appropriate scoring instrument for a study is difficult and requires at least a basic understanding of the instruments available and the pros and cons of each. However, no single scoring instrument is capable of capturing all of the information from a well-designed study, and, thus, the instruments described in this chapter are regularly used in combination. New scoring instruments are constantly being developed. 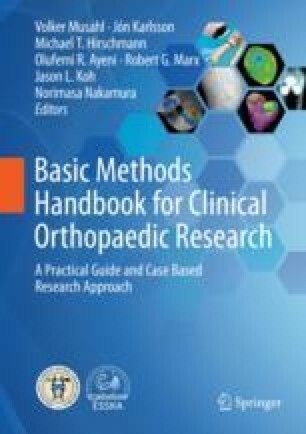 This chapter is meant to serve as an overview of the different types of scoring instruments that currently exist, with special attention devoted to reviewing the patient-reported outcome measures (PROMs) that have been recommended by the American Academy of Orthopaedic Surgeons (AAOS). Zaina F, Tomkins-Lane C, Carragee E, Negrini S. Surgical versus non-surgical treatment for lumbar spinal stenosis. Cochrane Database Syst Rev. 2016;(1):CD010264. https://doi.org/10.1002/14651858.CD010264.pub2.